Reaction Mechanisms in Sulfuric Acid and other Strong Acid Solutions covers the reactivity in sulfuric acid and other strongly acid solutions. 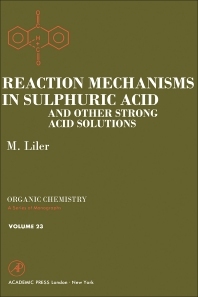 This book is composed of five chapters that emphasize the measure of acidity of sulfuric acid and other acid solutions. Chapters 1 and 2 discuss the physical, thermodynamic, spectroscopic properties, and acidity functions of sulfuric acid/water mixtures. Chapters 3 and 4 examine the protonation and more complex modes of ionization of compounds in these acidic media. Chapter 5 outlines first the possible mechanisms of reactions in acid solutions followed by a discussion of mechanistic criteria that have been developed in order to distinguish between kinetically indistinguishable alternatives. This chapter also presents some methods of kinetic investigation, which are specific to concentrated sulfuric acid solutions. Inorganic chemists and researchers, teachers, and students will find this book invaluable.